What is B Complex 100? B Vitamins work together in a group to provide the body with energy and to keep the brain and nervous system healthy. They convert protein, carbohydrates and fats into energy and synthesize brain chemicals to help your mood and nerves. B Vitamins are usually found together in the same foods and work as a team in our body. In fact, they have so much in common as a group that they are often considered a single entity. Many of us do not get enough B Vitamins; according to health professionals, deficiencies in Folic Acid, B12, and B6 are especially common. Additionally, because B Vitamins are required to break down caffeine and refined sugars, consumption of them may deplete and use up your body's stores of necessary B Vitamin nutrients during the digestive process. 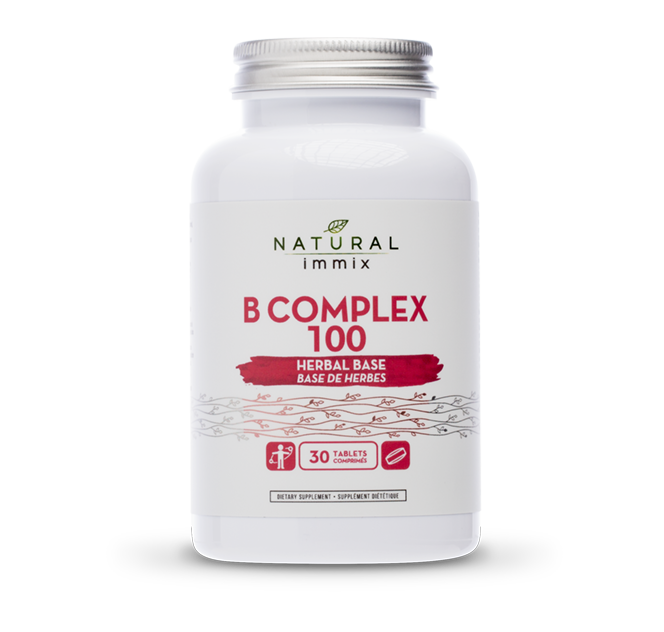 Tiredness, irritability, depression and nervousness are some of the many symptoms that indicate supplementation with a Vitamin B complex may be recommended. Vitamin B5, also known as Pantothenic Acid (also known as Pantothenate) is a required cofactor in numerous enzymes; the molecule it produces, a coenzyme known as Coenzyme A (CoA) is ubiquitous in the human body. Pantothenic Acid's major role in the human body is to be provided as a substrate that is required to form Co-enzyme A, a required cofactor for many enzymes in the human body. Co-enzyme A is required in approximately 4% of all known enzymes as a cofactor, mostly known for being involved in energy production. Vitamin B6, also known as Pyridoxine, is an essential vitamin for nervous system health, particularly for a healthy brain. It is used for both brain development and function. A deficiency of this vitamin can lead to difficulty learning, confusion and memory loss. Vitamin B6 helps with the synthesis of neurotransmitters, the chemicals that transmit messages from neuron to neuron. It is also necessary for the production of hormones that regulate mood and sleep cycles — serotonin, norepinephrine and melatonin. It is possible that this vitamin for nerves may help to raise serotonin levels, thus alleviating depression. Folic Acid, also known as Folate, is another B Vitamin (Vitamin B9) that is known to support healthy brain functioning. Folate, as well as Vitamin B6 and B12, are a must for the regulation of the amino acid, homocysteine. High homocysteine levels are linked with an increased risk for stroke and dementia, as well as heart disease. Folate deficiency in pregnant women has also been connected to problems with nerve cell formation in developing fetuses. Vitamin B12, also known as Cyanocobalamin, is another important nutrient for nervous system development. It is also important for the protection of the nervous system and the prevention of deterioration of nerves as the body ages. Ironically, the people who are most in need of Vitamin B12 for nervous system maintenance, those who are over the age of 50, are the ones who are most likely to have a deficiency. This is because poor absorption is common amongst this age group. As the best sources of Vitamin B12 are animal products, vegetarians and vegans may lack sufficient levels as well. Vitamin B1, also known as Thiamine or Thiamin, helps increase a person's appetite while it also keeps the nerves in good working order. Nerves, who are the "communicators" of the body, are important to the process of digestion, because they help regulate the way we act and move, for example when we eat  the nerves send the message to our brains that the food is tasty or not or even when we're already full or still wants some more. Vitamin B3, also known as Niacin, is necessary for the health of the digestive tract as it contributes greatly to its general health and functioning as well as keeps its surfaces healthy. Niacin also helps to keep the tongue in good health and to be able to perform its role in the digestive process more efficiently. Folic Acid, also known as Folate and Folacin or Vitamin B9, is important to the maintenance of the gastrointestinal tract. Vitamin B2, also known as Riboflavin, is a vitamin because it can produce two cofactors abbreviated as FAD and FMN. Some proteins in the body are dependent on these cofactors to function optimally and dietary Riboflavin is the sole provider of FAD and FMN for these enzymes, which are called flavoproteins since FAD and FMN are 'flavins' and work in concert with these proteins.